The tracks and trails of Bright Davokar offer a balance of plenty and peril. The traveler or treasure-seeker in these outer regions has a fair chance of leaving unscathed. 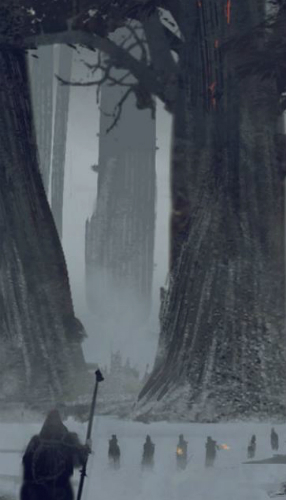 However, the trees along the rim of the great forest provide a home for the many barbarian clans, as well as a plethora of small animals, predators, plants, fungi and ne’er-do-wells. Many of the ruins hereabouts will have long since given up their more significant treasures, but a determined individual might yet uncover something to make the journey worthwhile and return with a rousing tale of bravery. Over the last month or so the Twitter account of The Iron Pact – @theironpact – has gathered brief seeds for encounters in the range of Bright Davokar – and other forested areas. For the time being I make these Forest Encounters available as a simple PDF and something a little fancier with fonts and all – fancy Forest Encounters PDF. The Forest Encounter table has more than one mode of use. First, you can simply choose something off the list that fits the mood, adventure or situation. If you need to have something involving birds, pick one that fits. Need strangle symbolism, pick an appropriate sign to worry the characters. Second, you can roll 1D100 against the whole table and choose something completely at random. If you simply want to throw a curve ball at a stale situation, throw the bones and see what happens. Third, if you want to be a little more specific, without choosing – opt for the category in the second column and then roll 1D10. Need a sign, but not certain what – find Signs and roll 1D10. Where appropriate, the information included has a Test that might glean additional information, meaning or insight from a situation. Don’t feel tied to the suggestion if you want to pass the information on. Also, if you have a character that might recognise something but doesn’t have an Ability to match – offer the information. Maybe you have a character raised in the forest who doesn’t have Beast Lore – who would likely know something about local animals anyway. In that circumstance, you could just offer the information rather than have them roll a Cunning Test. Your call! Very cool d100 table, and I love the idea of tying random encounters to a Twitter account.